This woodcut comes from Passionary of Christ and Antichrist, a famous series by the Renaissance artist Lucas Cranach the Elder (1472-1553). 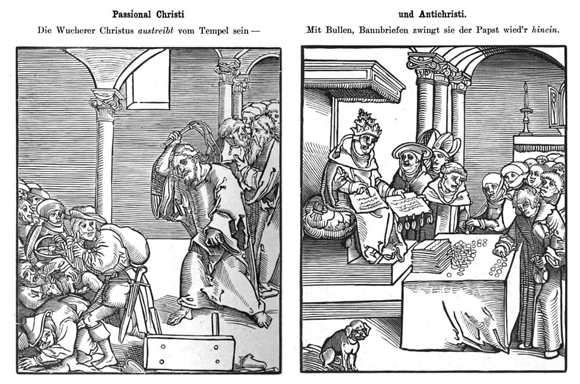 In the series, Cranach portrays the pope not as the vicar, but rather as the enemy of Christ. For centuries, reformers both orthodox and heterodox had employed similar juxtapositions, which drew on imagery from the Book of Revelation. This pair of images contrasts Christ, who drives the moneychangers out of the temple, with the pope, who welcomes them into the Church as sellers of indulgences. Woodcut, 1521. Source: William Herman Theodore Dau, At the Tribunal of Caesar: Leaves from the Story of Luther's Life. St. Louis: Concordia Pub. House, 1921, pp. 276-77.